If you have been jonesing for the Galaxy Note 4 to be put under the microscope, it is your lucky day, as that's precisely what has happened to Samsung's newest phablet. Besides putting the speaker grills, Samsung logo, and even the S Pen stylus under the enlarging capabilities of the microscope, the Note 4's screen has also been subjected to the treatment. Looking at the pixel matrix arrangement of the phablet's 5.7" 1440 x 2560 pixels QHD Super AMOLED display, we can finally put to rest any doubts that Samsung has used its trademark "diamond pixel" PenTile technology to achieve this crazy pixel density on an AMOLED panel. 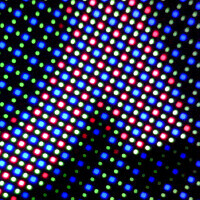 Unlike traditional RGB LCD displays where each pixel is made out of a red, green, and blue sub-pixel, PenTile displays use less sub-pixels, as they are arranged in an alternative manner. As you can see, in the Note 4 we have diamond-shaped sub-pixels for the blue and red colors, and an oval-shaped green sub-pixel, like on the Galaxy S4, for instance. In the Galaxy S5 and Note 3, all sub-pixels are in the diamond shape, so that's a return to the first diamond pixel edition for Samsung, warranted perhaps by the hearty 515ppi pixel density of the display. doesn't change the fact that it's the best display out there. LCD says bye. You can see practically any review of note 4 along with displaymate's analysis. Note 4 display is beyond the reach of any LCD. Be happy with your 6 rows of LCD. Being butthurt with ur jealously of the fruit's success. You came in to a Note 4's article to show your passion for the 6+. It shows insecurity if you ask me. And If anyone is butthurt, i bet it's you. Just curious, how many tabs on Safari can you open at once, like on a real computer? can you split the screen and text while you watch YouTube? And what happens when you run out of storage? Delete or move to the cloud versus just adding a bigger sd card? Your iPhone is a nice phone but has severe limitation for those of use who want to multi task, take our songs, movies and games with us and be able to increase our storage, battery size and usability range. Yeah, the iphone may beat my G3 in some benchmarks but I don't run benchmarks all day. I run multiple apps on several tabs daily while jamming to music and texting and surfing at the same time. Apple is new to this but Droid has had it for years. As for NFC, Apple is playing catch up again. So what happens when you have issues with your battery like others? you have to return the phone versus just swapping out the battery. And when your on board storage runs low? Either the cloud or buy a new phone. And the price of the Apple is stupid as hell! Unless you are in a contract, the 128gb Plus can run close to $1200! I paid $500 for my G3 and it is more flexible, has a 4k display, has more memory and storage and a swappable battery and I don't have to worry about the cloud when I go hiking, skiing, boating or leave the city. Are you from 2012 ? Tell me a single Note 3 or S4 user with burn-in problems ? Ignorant fools. Ooh, a two generation old device! That's relevant! Yeah, whichever gen. doesn't change the fact that amoled lifespan dies much faster than expect. Find out more about ur cartoonish display before commenting here, fool! By cartoonish, you must mean most colour accurate, since that's what it has proven to be (by scientific testing, not by biased eyes like yours). I have an almost three year old Galaxy S3 with zero burn in and it looks like new. And up until I got the Note 4 a month ago, it was getting an average of 5 hours screen on time every day over those years. I know it hurts, and I know your tears are bitter, but the Note 4 screen is the best you can get right now, for max brightness, for colour and white accuracy, for sharpness, for contrast. While I agree with most things you said AMOLEDs simply can't match LCDs in brightness. Note 4 has max brightness of 400 nits while phones like Z3 and HTC EYE have brightness of 800 nits. That is simply nowhere near matching or surpassing it. But the reflexivity of Amoled is most of the time far lower than the LCD's, which make them as readable in direct sunlight as LCD displays (if not more). Plus, in direct sunlight (more than 40.000 lux), the brightness of the Note 4 (and the S5) increase a lot, if auto brightness is activated. Please read the reply I posted to tedkord, who pointed same thing to me, so I wouldn't be spamming comment section with copy-pasting same reply over and over. The Note 4 max brightness, as measured by Displaymate, it's around 750 nits. You're trying to act smart, but you're failing miserabley at it. If you know who Amoled technology work, then you would know why only the darker pixels reach the highest nits. p.s: next time you wanna argue about outdoor visibility between LCDs and Amoleds, make sure to mention the reflectivity of each panel. I'm afraid you misunderstood something I wrote or you've taken it intentionally out of context. Nowhere did I, in either of my posts mention outdoor visibility or reflectivity of panel itself. As for your first statement, I fully understand why only small part of screen can be lit up properly on AMOLED screens and that is it's inherent flaw that keeps it from having high brightness output on ENTIRE SCREEN AT THE SAME TIME (used caps lock only to point to my original claim). Again, I'm not claiming anything about outdoor visibility or reflectivity of the panel. My only point is that LCD panel can output much higher brightness levels over the same area compared to AMOLED. If you have any proof regarding to physics that current AMOLEDs can be brighter than LCDs on full white screen please give me a link since I would love to read it. I will take my IPS LCD on the G3 over the Apple Retina any day. Now, I don't keep my phones long enough (4 months at the most) to experience burn in. But my phones rarely sit at full display brightness and not used for something. When they do sit idle, they go into daydream which shutters the bright screen. Apple has a nice display but the technology and pixel count is still way behind most Droid phones. But while I enjoy both platforms and have used each, I prefer the G3 but know Sheeple will find a way to criticize the G3. I have Galaxy S2 for 3 years and I don't have any burn-in problems whatsoever. Nice try you apple fanboy.